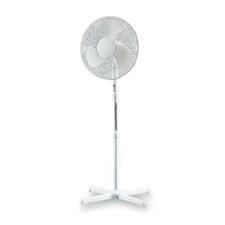 18" Pedestal Fan offers three speeds and a powerful motor with large 18" blades for maximum air flow. Push-button control has high, medium and low settings. Turn oscillation on and off. 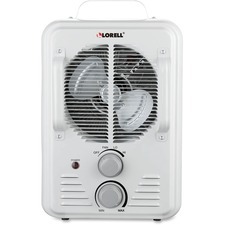 Fan features super quiet operation; two-prong plug and sturdy steel stand with safety grill. Height adjusts from 44" to 54". 0.65A AMP. HZ-7300 EnergySmart Cool Touch Heater provides energy savings, excellent safety features and the ability to control your comfort all at a reasonable price. EnergySmart Technology uses energy wisely to self-regulate electricity flow based on temperature for precise, intelligent comfort. Energy Usage Indicator displays the amount of energy used at any time. Digital LED lights accurately indicate room temperature and desired temperature. Three heat settings provide "Just Right" comfort. Safety features include tipover safety protection, overheat protection device, Cool Touch Safety housing and an extra-wide, sturdy base. Enjoy personal warming with fan-forced heat circulation. 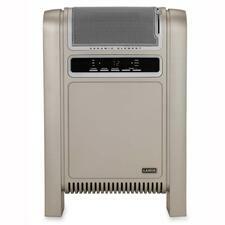 Heater also oscillates for wide area heating. 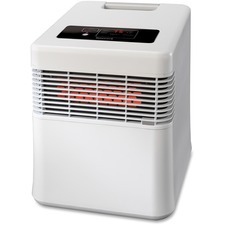 Oscillating heater with adjustable thermostat offers a fan powerful enough to spread heat over a wide area, while combating drafts in any office or study. Provides both 750 watt and 1,500 watt heat settings and variable fan speeds. Includes fan only function for multi-season use. Advanced safety features include tip protection and auto shut off to prevent overheating. Oscillating heater is small enough to easily fit on a desk. 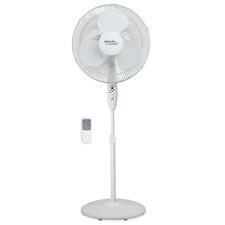 16" Floor Fan with remote oscillates with three speed choices. The three blades are made of ABS plastic. Infrared ray remote control offers a four-hour timer and includes batteries. 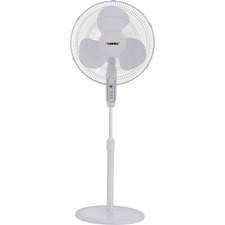 The fan includes a 6' power cord. 16" fan with pull chain can be mounted to your wall. Fan offers a single pull-chain switch, three speed settings, and an oscillating and adjustable tilt head. Mount to wood or metal support when attached to drywall. Fan includes mounting hardware and a 5' power cord. UL and cUL approved. 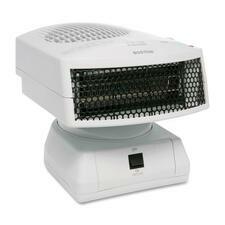 Ceramic heater offers two heat settings of 900 and 1500 watts plus fan only. Equipped with a tipover switch for safety, fan will automatically shut off if it tips over. Other safety features include resettable thermal cutoff, overheat protection and cool-touch housing. Built-in carry handle is recessed so you won't notice it's there until you need it. 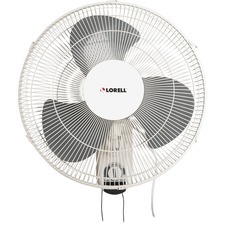 16" floor fan with remote oscillates with three speed choices. The three blades are made of ABS plastic. Infrared ray remote control offers a four-hour timer. The fan also features a round floor base, 16" blade span, 50-decibel noise level, and 6' power cord with two-prong grounded plug. Fan adjusts from 41" to 48" high. ETL approved. 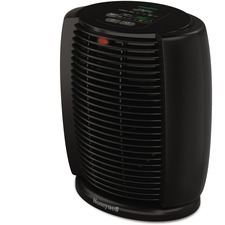 Heater creates powerful, even heating for any room. Quiet fan circulates soft, warm air for effective whole room comfort. Infrared heater provides immediate personal warmth and can handle extra-large rooms. Cool-touch housing and handle provide an easy way to move the heater safely. Heater provides protection from overheating and tipping over. Robust, metal interior construction offers reliable heating in a long-lasting design. Large LCD lets you change between two continuous heat settings. Programmable thermostat and temperature display allow easy use. Remote control allows you to change settings from a distance.